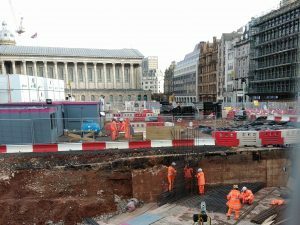 Strengthening works have begun on the former subway in Paradise Street following demolition earlier this year for the Birmingham Westside Metro extension. The subway will reopen when the route is operational, and the steel reinforcement has been fixed for the retaining walls and abutments, which will help carry the weight of the road and tramway as it passes above. Works to demolish the subway got underway in the summer using high-pressure water jet equipment in place of conventional tools. The hydro demolition method has environmental and safety benefits, including reducing dust and noise pollution. Water was sprayed to cut away and break up the concrete and other materials for a cleaner and greener demolition.